This classic steamship which sails Loch Katrine in the heart of Scotland, is named after the eminent author who highlighted the Trossachs area in his poem of 1810, 'The Lady of the Lake'. The cruises by SS Sir Walter Scott provide the perfect opportunity for visitors from all over the world to explore this tranquil wooded loch mirroring Ben Venue, the dominant mountain at its easterly end. Built by William Denny & Bros Ltd, Dumbarton in 1900, the vessel was taken in knocked-down form by barge up Loch Lomond, then overland by horse-drawn carts to Loch Katrine for re-assembly and launching. She measures 33.8 x 5.8 metres (110 x 19 feet), and weighs 110 tons. When she entered service, the Sir Walter Scott was only one of several such inland-loch steamers offering pleasure sailings. Now, she is unique as the only surviving screw-propelled steamer in regular passenger service in Scotland, her sleek hull still powered by the original triple-expansion steam engine. 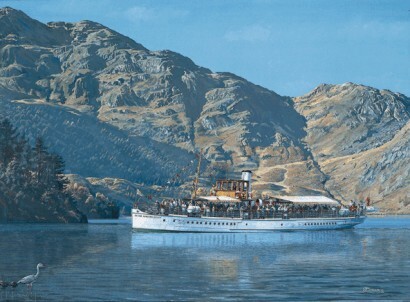 To sail on board the Sir Walter Scott with the dramatic visual backdrop slowly unfolding, coupled with the gentle rhythms of the almost-silent steam engine and soft lapping water, makes for an enchanting experience few ever forget. All the elements of this lovely scene are captured in this atmospheric painting by Gordon Bauwens. Individually signed 'Open' edition prints. Builders: William Denny & Bros.